White. Everything is white with snow that fell during the night. Unable to drink from her frozen water bowl, Annie vacuums up the snow. Her world is one giant snow cone. As I crunch along in my slippers, I look up and see blue sky with white etchings, the top of the Sitka spruce tipped with sunlight, the leafless branches of the red alders flocked with snow. It has been a crazy-weather weekend. Just last Friday, I sat outside in the sun reading a book while Annie chewed on a branch fallen from the last wind storm. Saturday we had light rain, but the snow predictions seemed unrealistic. Sunday, I awoke to the sound of Annie barking at the hail banging on the skylights. But that soon stopped. In church, as we stood to go to Communion, I glanced out the window and saw snow falling. So beautiful and so worrisome. We all had to drive home. But by the time Mass ended, the snow was gone, everything merely wet. The restless dog and I went walking, she just in her collar, I so bundled up I could barely move. Tiny flecks of hail fell around us, no big deal. 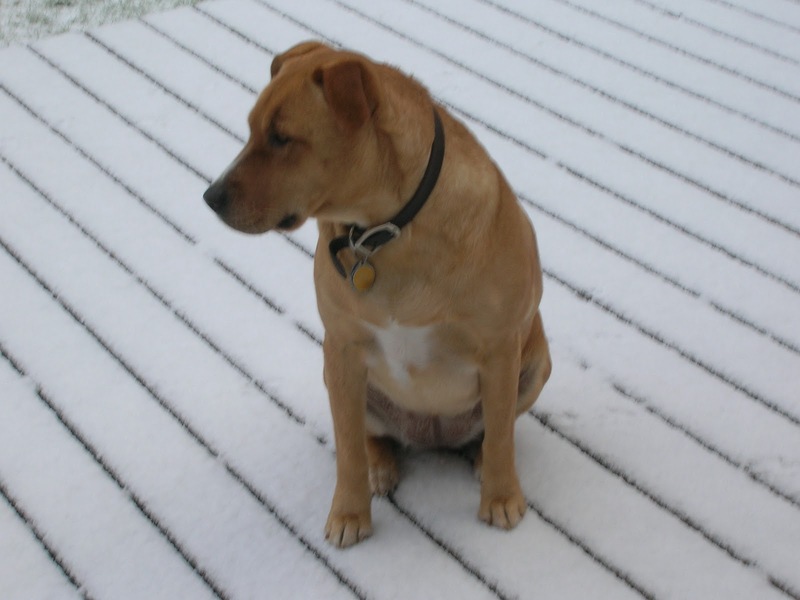 It wasn’t until we turned back onto our street that the serious hail came, half-inch balls of ice pounding on our heads, gathering on my coat and Annie’s fur. “Hurry!” I urged, but the dog kept trying to dive under bushes instead of heading for the sure security of the house. When the hail stopped a few minutes later, the earth seemed to sigh as the pounding ceased. Around 4:00, the snow finally came, thick, fluffy, some of the flakes looking like shreds of paper floating down onto deck, lawn and concrete. Staring at it made me dizzy, but I couldn’t look away. Annie stood beside me at the window, amazed. Beneath the arborvitae out front, two dark-feathered birds flittered around, pecking for bugs, undaunted. For the rest of the night, the snow came and went, but this morning, everything was covered in smooth white, untracked until Annie started eating it. Our ratty patio furniture looked perfect, its nicks and rust-stains hidden in a coat of snow. Sunlight sparkled off the white surface, making everything glow. Ah, snow. Online, I read reports of cars sliding around, danger on the roads, homeless people gathering in a shelter at the fairgrounds, but here at home, all is safe and special today. We first saw snow here in February 1996, when Fred and I drove up from California for the annual Newport Seafood and Wine Festival. Prepared for rain, we were surprised by the biting cold and had to go buy warmer clothing. Staying at the Ester Lee in Lincoln City, we awoke to snow on the window sills and on the beach. Does it snow here on the central Oregon coast, we wondered. We needed to know because we were already planning to move here. Oh no, people told us. This never happens. Snow on the beach? Nah. Hah. Yes, it does. It’s the beach, but it’s also the Northwest. Nearly every year, it gets cold enough to snow, and if the rain comes at that time, it does snow right here on the beach and all around us. It’s icy, slippery, dangerous, and so pretty. Would we have moved here if we knew this? Probably. We wouldn’t have believed it. Just like Annie keeps putting her tongue on that frozen water, expecting to get a drink.